A couple weeks ago, I finished converting my Honda Element into the world's tiniest home on wheels. As a dude who travels with little interior design experience, the conversion came out better than I could have imagined. One of the main features that took my Element from livable to friggin' sweet are its patterned fabric blackout windows. 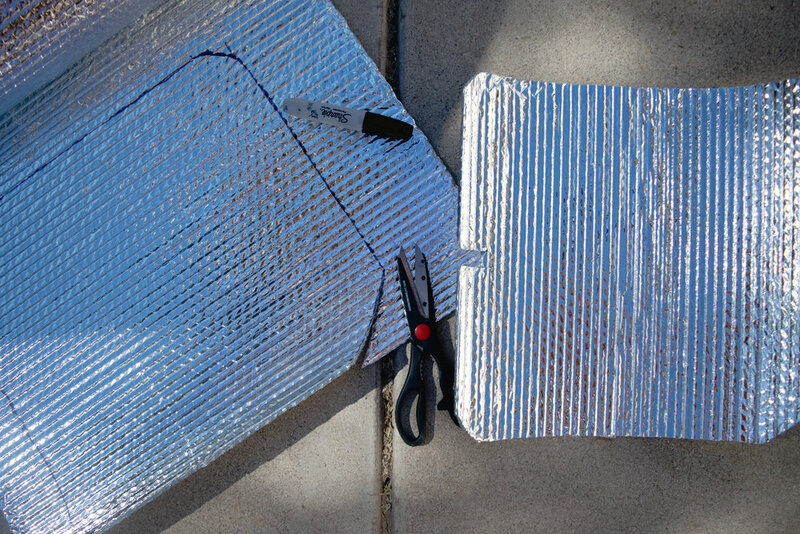 Made with a shiny, insulating material called Reflectix, most projects using this material end up feel like the inside of a low budget spaceship. I wanted a more homey, bright look to my space that didn't feel quite so shoddy or depressing. Patterned fabric, adhesive spray, and black duct tape proved the perfect solution. In addition to looking great on the inside, these window shades blackout virtually all outside light. They also make it impossible to see into my Element, so I can comfortably sleep, with complete privacy, anywhere I'm allowed to park. 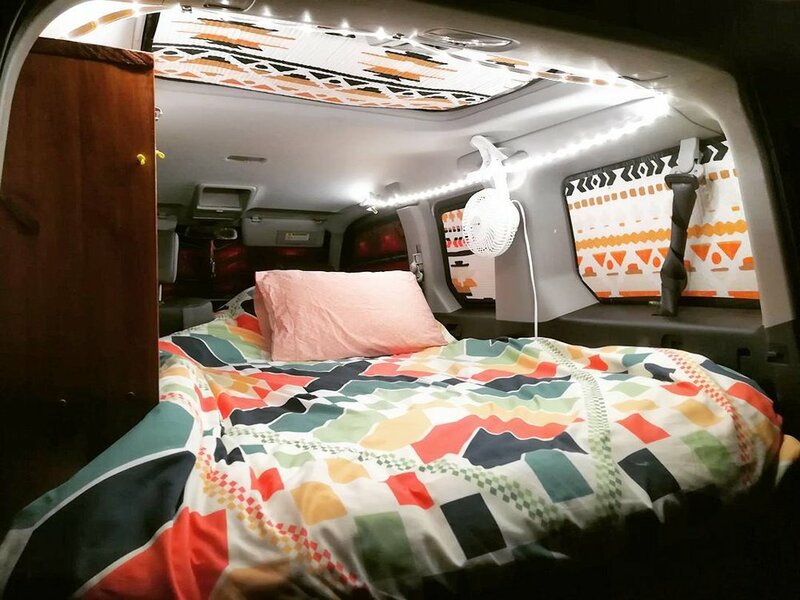 I figured it worthwhile to explain how I made my blackout window shades for anyone else trying to overcome the universal hurdles of comfortably sleeping in a vehicle. Disclosure: Some of the above supplies are affiliate links. At no additional cost to you, I'll earn a commission if you click through and buy something. 1. Measure a window, length x height with tape measure. Cut a cardboard piece with an additional inch or two added to those dimensions (cutting away extra material is a million times easier than taping it back on). 2. Take your cardboard piece, those heavy duty scissors, and the permanent marker into your vehicle. Hold the cardboard up against the inside of the window. Mark a bit less than you think you should take off a corner. Cut it off. Repeat until cardboard fits snug into the recessed area of the window (the word “snug” is key if you want window shades to remain in windows). 3. Trace cardboard on Reflectix material. Cut it out, slightly larger (again: cutting away extra material is a million times easier than taping it back on). Push Reflectix piece into that same window and trim to achieve a snug, uncrinkled fit. If not snug, window shade will not stay in window! 4. Repeat Steps 1 to 3 for every window. Pro Tip: Windows on the sides of your vehicle come in pairs! Just trace your first window shade and cut it out (slightly larger, and then trim to exact size) to save time. 5. Once you have all your window shades cut to size, coat outward facing side with matte black spray paint. To make sure you don't spray the wrong side, put each piece in its window and mark the outside with permanent marker as you take them down. Let paint dry before continuing. 6. 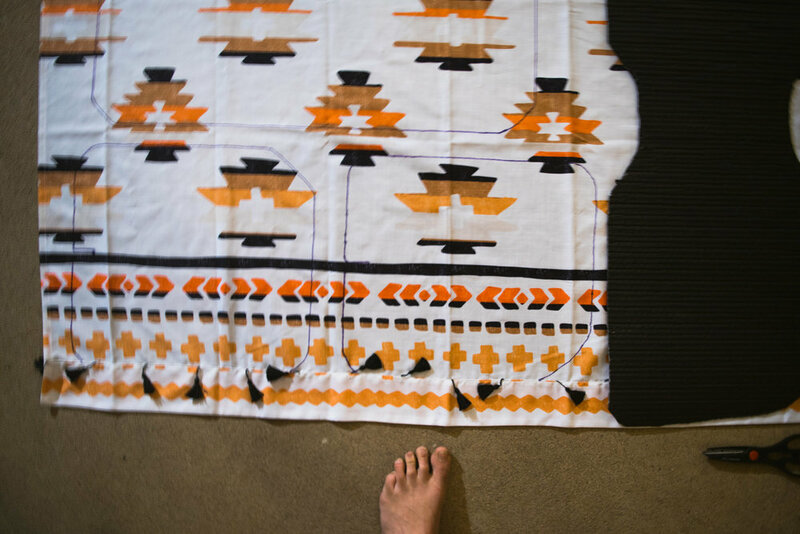 Spread out your beautiful roll of patterned fabric. Place all window shades black-side-up on fabric (consider pairs of windows and the direction the pattern is going on each piece for when you actually put them up in your windows). 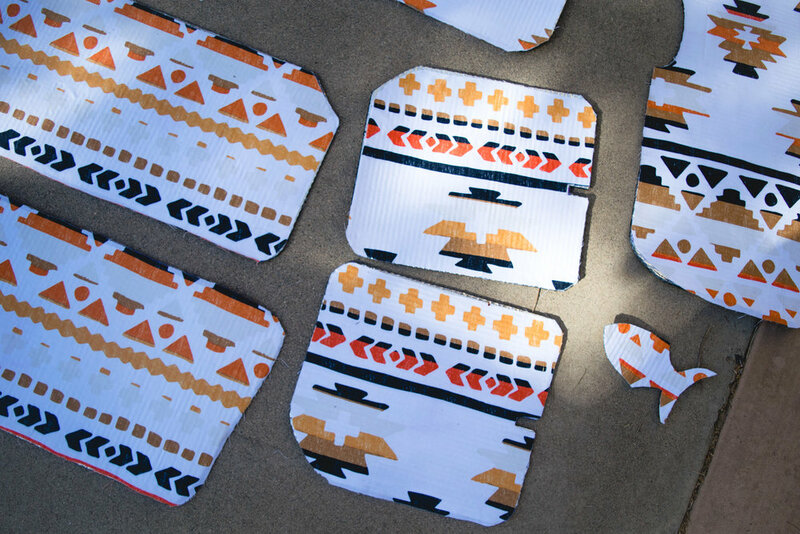 Trace each window shade onto fabric with permanent marker and cut out all fabric pieces. 7. Cover the silver side of window shade in Adhesive Spray. Wait until tacky. Stick and press matching fabric piece on. 8. Apply maximum strength duct tape, hot-dog-style, around edges of window shade to secure fabric. To make this look good, align each piece of duct tape with its previous piece on the fabric side (you won't see black side of window shade). Use long pieces of duct tape on straightaways and short pieces on curves. 9. If you've used a strong, quality duct tape, like the kind made by Gorilla Glue, you're done! Whoo! If, like me, you bought cheap, knock-off duct tape and it's starting to peel up, you're in for a long process of getting the duct tape really hot with an iron to help it adhere better (use a scrap piece of fabric between the iron and tape so it doesn't burn). Trust me, you don't bother with this step—get quality tape.